On the fence about sending your staff to an event? In this post we’ll explore why it just might be worth it. It’s easy to see why many managers don’t prioritize sending staff to industry events or conferences. They can be expensive, they require time away from the office, and the return-on-investment isn’t always clear. But, professional events provide opportunities that your staff simply can’t get elsewhere. When employees attend an event, they learn new skills, make new connections, expose your brand to new audiences, and so much more. If you’re still skeptical, keep reading! Industry events give your employees the opportunity to interact with other professionals in their field. They can meet members of other companies, converse with industry experts, and make lasting connections during their time at trade shows or conferences. In today’s era of virtual communication, we often forget how effective in-person interaction can be. When your employees attend industry events, they have the ability to forge meaningful business relationships that simply can’t be duplicated via email or telephone conversation. A spontaneous conversation at an event may just lead to a long-term business relationship for your company. Fortunately, many events put networking front-and-center. Take for instance, Agency Nation’s Elevate. This two-day event is filled with networking opportunities for those in the insurance space to connect and even boast and even leverages event management software to make introductions easier. Most events feature presentations and workshops from industry experts and influencers. These presentations aim to teach attendees new skills, best practices, and actionable ways to achieve long-term success. As long as your employees are attentive and eager to learn, they’ll leave with new tools and ideas to incorporate into in their day-to-day workflow. Consider how events like Apple’s Worldwide Developer’s Conference offer workshops and one-on-one consultations with company engineers. This type of practice isn’t only familiar to technology conferences—it can be seen across industries. Whether events have dedicated workshops or not, think of them as training opportunities. Your employees can then return and present what they learned to their coworkers, and your entire organization will benefit. Live coverage: Your employees can post updates on social media throughout the event – everything from Instagram photos to tweets featuring quotes from a keynote speech. Make sure that they use any event-specific hashtags to boost exposure to their live coverage. Video: Generating ideas for videos can be a struggle for marketers – but live events offer a number of opportunities for unique videos. Your employees can capture key moments from the conference, or even run a live stream from inside the event hall where they update followers in real time. Blog posts: Following the event, you can publish a follow-up blog breaking down key takeaways and top moments for those who are unable to attend. Keep in mind: if you want to leverage events for your content marketing strategy, you need to prepare accordingly. Research the event ahead of time and develop a list of sessions and activities your employees should prioritize for optimal content creation. Your employees represent your brand at an industry event, even if they are only there as attendees. According to branding best practices, when your company has a presence at an event, it establishes your brand as a recognizable and important player in your industry. Make sure you only send employees who will represent your company in a positive light at any event. Not only should your staff be professional, but they should have a comprehensive knowledge of your company so they can discuss it with other attendees at the event. It may be tempting to send only sales representatives, but sending a mix of employees from different departments will provide a more complete representation of your company and enable knowledge to flow more openly across your company. Every employee’s motivation dips from time to time. When you go through the same routine every single day, it’s natural to lose focus or burn out. An event provides a great opportunity to step away from the day-to-day monotony of work and experience something fresh and exciting. Your employees will build skills and gain actionable insights while at an event, but they will also feel reinvigorated after spending some time in a new, high-energy atmosphere. You may think that spending time out of the office will hurt productivity – but once your employees return, they will likely be more productive than ever thanks to their newfound motivation and inspiration. Speak with your employees in the days following an event – you’ll likely discover that they are rejuvenated and more motivated than they were before they left. We understand sending your employees to conferences and tradeshows is a costly investment. But industry events accomplish much more than just sending your stuff on a fun trip. Events can have a major positive impact both on your employees and on your brand. Remember to prep your employees prior to sending them to an event so you can be sure to maximize these benefits. Then, you’ll begin to see that attending events is more than worth the cost. Wondering how you make events a driver for your business strategy? 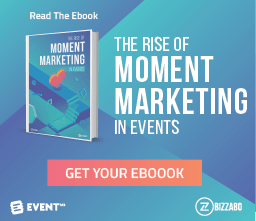 Read The Rise of Moment Marketing today.